These will be gone as soon as they hit the buffet table. 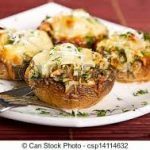 This stuffed mushrooms in garlic wine sauce recipe is awesome! Super Bowl Sunday would be a great time to use these delectable delights.Note: You can change the number of people served by placing your cursor over "Servings". The Ingredients will adjust to the new number of servings. Heat butter in a medium skillet over medium heat. Cook shallot and garlic in hot butter until slightly browned. Carefully add wine and broth. Bring just to boiling; reduce heat. Simmer, uncovered, for 15 minutes. Transfer to a 3-quart au gratin dish or casserole.Preheat oven to 425 degrees F.
Remove stems from mushrooms. Spoon a rounded teaspoon of cheese into each mushroom. Arrange the filled mushrooms, cheese side up, in the dish. Bake uncovered for 10 to 12 minutes or until heated through. Sprinkle wih the snipped fresh herbs. Serve hot.